Attend a Generator Dinner to talk about challenges and ideas, find teammates, and learn about the competition process. 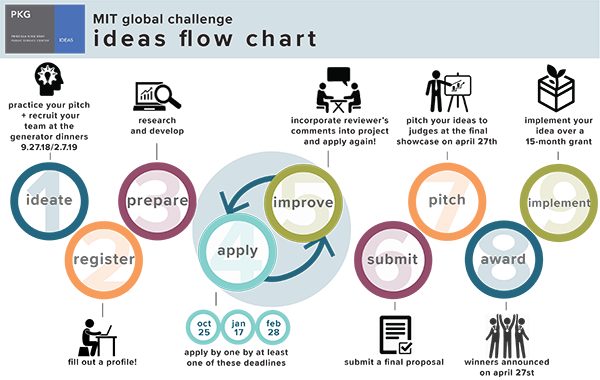 IDEAS teams are created and led by MIT undergraduate and graduate students. As long as your team is led by MIT students, you can invite anyone from around the world to join you as team members. We are looking for innovative devices, systems, and processes that benefit communities locally, nationally, or internationally. Throughout the academic year, we'll work with you to help develop your project - from networking and mentorship events, to reviewer feedback on initial scope statements, to targeted workshops to help you develop skills and approaches to strengthen your project. Teams must participate in at least one initial entry round. Teams that meet our basic eligibility requirements are then invited to submit a final proposal in the spring. The judging process is two-tiered, involving evaluations of both your written proposals and in-person pitches to judges at the Innovation Showcase. Get started by learning more about the competition at the links below!